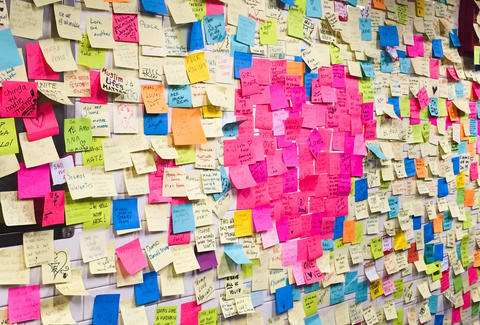 The sticky notes, which had been accumulating for more than a month, were removed on Friday, but not to fear: Governor Cuomo announced that the New-York Historical Society will archive and preserve the majority of them. And the project won’t end there -- the Historical Society is inviting New Yorkers to continue to post notes at its front entrance at 170 Central Park West instead until January 20th. Governor Cuomo left a sticky note himself back November, quoting Emma Lazarus’ “Give me your tired” line. Although there is no current plan to display the notes, the Historical Society plans to preserve the notes in between sheets of mylar at 12 notes per sheet. This is also not the first time the Historical Society has collected and preserved public displays of emotion or support -- earlier this year, it collected objects and signs left outside of Stonewall Inn in honor of the victims of the Orlando Pulse shooting, and 15 years ago, it collected messages left throughout New York City following the 9/11 attacks. Here’s to hoping your post-election sentiment will be forever preserved for history, no matter how 2017 actually goes. Ciera Velarde is an editorial production assistant at Thrillist who will miss seeing the wall during her daily commute. Follow her on Instagram.